Physics professor Jenny Hoffman arrived at UBC this summer after ten years teaching at Harvard. “My toenail is gone,” said Jenny Hoffman nodding at her foot. Hoffman is fresh off defending her title as America’s endurance running national champion. That meant leaving UBC on a Friday morning, arriving for the race in Cleveland that night and eating a can of processed ravioli before going to sleep. Waking up Saturday, she ran for 24 hours straight racking up a total distance of 223 km before boarding a plane home. She missed her connection into Toronto because she was too exhausted to pull her bag from the luggage carousel. By Monday morning, Hoffman, a renowned quantum physics professor who arrived at UBC this summer after 10 years at Harvard, was back on campus lecturing hundreds of first-year physics students. And, somewhere along the way, her toenail gave out. But if Hoffman is treading lightly in a literal sense, the hard-charging academic has little patience for what she sees as nonsense at the periphery of her new institution. Everyone has been really friendly, she is happy with her colleagues and the students are great. Hoffman emphasizes that she is grateful to be here. But the scientist chafes at UBC’s teaching assistants’ union, a point she raised early in the interview. “TA-ing should be considered a course not a job. There should be no union to try and reduce their hours,” Hoffman said. She added that she saw the attitude of CUPE 2278, the TA’s union on campus, as a cultural difference. “I’m coming from a place where people love their jobs,” she said. But despite the affinity Hoffman holds for Harvard where she also studied as an undergraduate, Hoffman came to UBC with an eye toward doing more collaborative research. 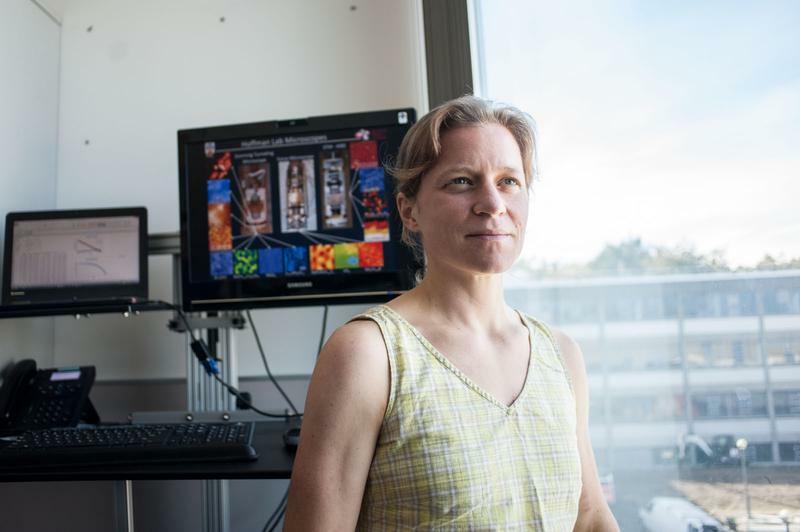 UBC has a slightly larger physics department than Harvard and a much larger team — around 15 researchers, according to Hoffman, focused on her sub-field of quantum materials. Specifically, Hoffman’s work focuses on building and analyzing new materials for conducting electrons — the kind of materials that end up being used in power lines, cellphones and computers. She said Harvard had a focus on attracting the single best professor in any given field which meant fewer total professors in any given specialty to collaborate with. Hoffman said she had long known collaboration was important to her, but it took her several years to decide she was unlikely to find what she was looking for teaching at Harvard. "[It's] really nice to be able to just pop next door and say, ‘Hey I’ve got a question about this,’” Hoffman said. After her move to UBC, she said quantum materials research is especially strong at the university. She was brought on as a Canada Excellence Research Chair, a national program focused on attracting foreign academics. The federal government will give UBC $10 million over the next seven years to support Hoffman and her research. But Hoffman, 37, sees her primary commitment as being toward students and is currently teaching an introductory physics course to first-years. While still adjusting to using Connect and iClickers, she said she enjoys working with students new to the field. “I feel like it’s my responsibility to keep them excited and recruit them to be physicists,” she said. She continued that she had found students on campus here to be more focused on academics than those in Cambridge where an unhealthy obsession with extracurriculars rules. Hoffman clarified that balance is important. She added that her own extracurricular, running, helps with the pressure of her work. Hoffman has been running since middle school but has, in her words, never been very talented. She barely made varsity on her high school track team and while she ran for fun at Harvard where she was on the crew team, it wasn’t until graduate school in Berkeley that she started running long distances competitively. Hoffman graduated from running marathons to the 100 mile races during her postdoc in California and has been running “ultras” (races longer than marathons) ever since. She also noted that the long distance running community is incredibly supportive even during competition. She found this refreshing coming from the more cutthroat worlds of rowing and track and field. Hoffman, who has three children ages three, six and nine, is hoping her milage in the Cleveland race will qualify her for the United States national team which has been a goal of hers for many years. “I do my work and run, basically,” she said.